Make sure you keep your hands on the wheel and eyes on the road in Canada. According to the National Post, a Canadian woman was found guilty of distracted driving for looking at her Apple Watch, even though she claimed she was just checking the time. A judge in the Ontario Court of Justice determined that the driver, identified as Victoria Ambrose, was spending too much time attending to her smartwatch and not enough time watching the road. Ambrose was fined $400 for the traffic stop. The incident occurred in April in the city of Guelph, located in Ontario. Per the National Post, Ambrose was sitting at a red light when she glanced at the Apple Watch on her wrist. A University of Guelph officer who was in his cruiser alongside her car noticed her checking the device, pulled her over, and gave her a ticket. By Ambrose’s account, she was simply checking the time on her Apple Watch—a task that requires tapping the device once to activate it in order to see the watch face, then tapping it again to deactivate the display. 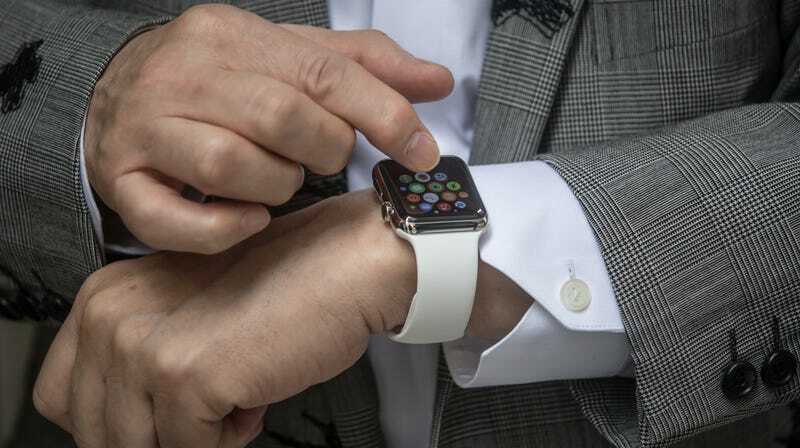 (The Apple Watch has a setting called “wrist raise” that automatically displays the time when a person moves their wrist, but it can be disabled by the user.) She also made the argument that the smartwatch isn’t a handheld device and should count as a mounted device, which is allowed under the law. Justice Phillips dismissed the semantic argument that the Apple Watch isn’t a “handheld wireless communication device” and instead decided to focus entirely on whether it was distracting the driver, and he felt there was a pretty obvious answer to that question. “It is abundantly clear from the evidence that Ms. Ambrose was distracted when the officer made his observations,” Phillipps said. It’s easy to imagine the Apple Watch offering a bit more safety than a standard smartphone by providing at-a-glance notifications that don’t require any interaction, but at least one study suggests that’s not the case. Per HuffPost, the Transport Research Laboratory researched just how distracting the Apple Watch is in 2015 and found that a driver reading a message on a smartwatch would take 2.52 seconds to react when an emergency maneuver is required, compared to just 0.9 seconds for a driver talking to a passenger. A driver using a smartphone reacted in 1.85 seconds. Adding to the problem is the fact that most people seem to believe it’s safer to drive with a hands-free device. The National Safety Council conducted an opinion poll in 2014 that found 80 percent of drivers in the US believe hands-free devices are safer than handheld devices—and 70 percent claimed to use hands-free devices for the purposes of improved safety. The Insurance Journal disputes that belief, citing more than 30 studies that show hands-free devices to be no safer than a handheld one, as the brain is just as distracted either way. Wait, Did Apple Just Stage a Life-Threatening Car Wreck for Its Emotional Apple Watch Ad?